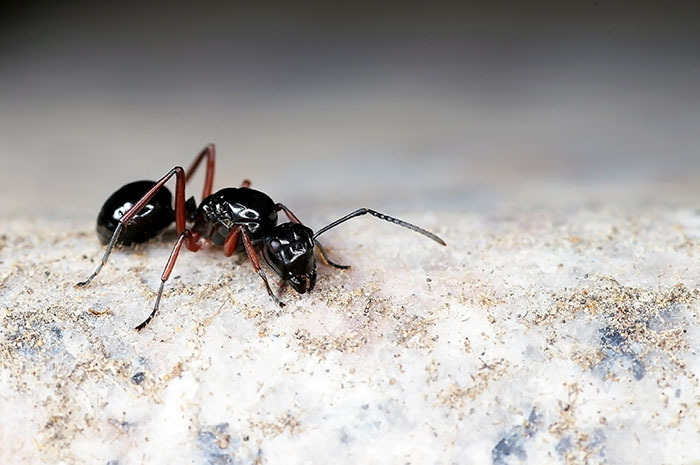 Ants’ nests are found in flowerbeds, under paving and at the base of walls. 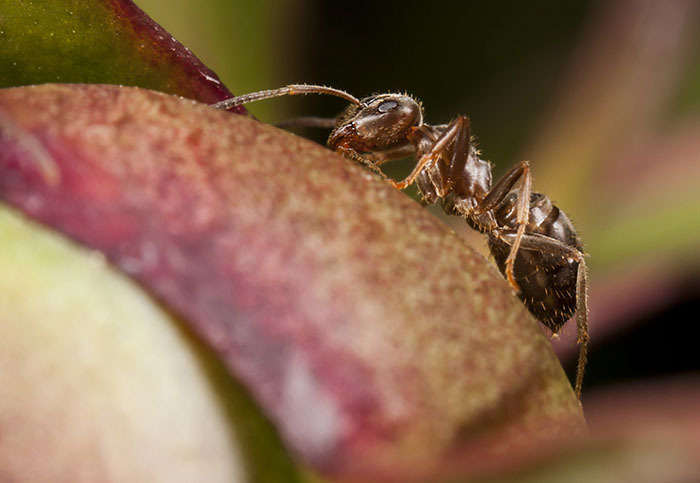 Worker ants usually invade properties in search of sweet food substances during the spring and summer months. The queen (winged) ants leave the nest to relocate during hot summer afternoons with thousands of flying ants taking to the air at once. Slightly smaller than the common ant, red ants’ nests are commonly found in garden areas, typically under paving stones or slabs. The red ant can deliver a painful sting which is injected with formic acid. 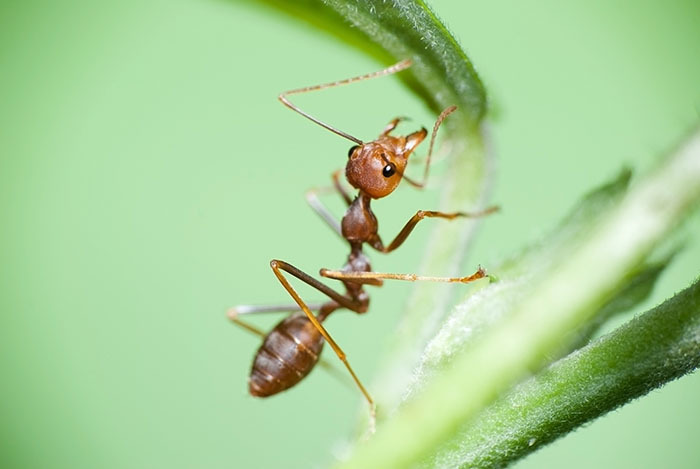 Each nest can last for many years with up to 1000 worker ants at any time. All eggs are laid by a single queen. The Pharaoh ant has readily taken up residence in the UK as an indoor species favouring warm heated buildings. Measuring around 4mm long, the ants are yellow and quickly spread as they are continually foraging for food and new nesting sites. Unlike most UK species these colonies are highly mobile with multiple queens in the same nest making treatment very difficult as traditional localised control methods do not kill all breeding sites and cause the colony to scatter and form multiple new colonies making the problem worse. Nests in soil can be far more extensive than the area around the surface and an effective treatment is professional spraying, although where possible it is best to leave nest sites alone if they are not a hazard. Within the house, nests can prove far more of a problem and pest control can help to eradicate nest sites or provide a barrier to insect entry. Pharaoh ants should be treated professionally with multiple methods employed to track and eradicate all queens within a building. Bed bugs feed on many warm blooded animals but unfortunately their preferred hosts are humans. The adults and nymphs hide in cracks around the skirting boards, behind headboards and under mattresses. They feed at night and leave often irritating bite marks on the hosts reflected in small specks of blood on sheets and pillows. Each female lays 200-500 eggs at temperatures above 14 degrees centigrade and they hatch within 17 days. Adults can live without feeding for up to a year in some circumstances. 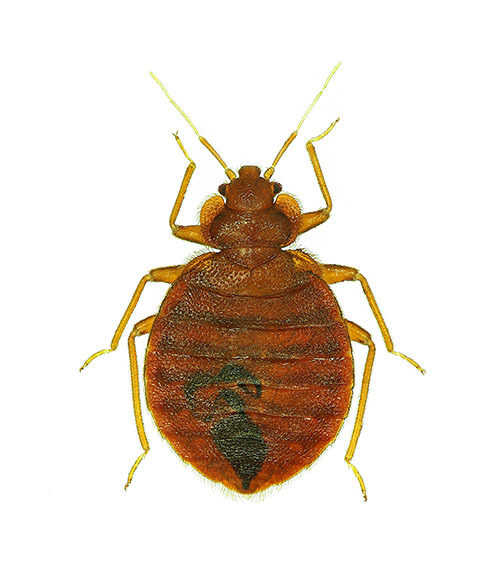 Bedbugs are mainly pests to humans but they can feed on pets, birds and bats. Well fed adults are the size and, colour as an apple pip. Dark red bed bugs should not be confused with tiny mites most people usually have in their beds – Bed bugs are much larger. Bed bugs do not live on the body but hide in the mattress, skirting boards or cracks in poor joinery in the bedroom. They are also found under wallpaper, the back of pictures and posters and in clocks and radios beside the bed and electric fittings in the bedroom. Their harbourage sites are normally fairly close to their hosts but they are capable of hunting down a feed by detecting a host’s body warmth and breath. So moving to another bedroom will only give short-term respite. They emerge at night and guzzle up to four times their body weight in 15 minute. A female can be responsible for many thousand of offspring a year. Bedbugs can infest even the cleanest of homes and an infestation does not indicate a dirty home. Bedbugs are difficult to eradicate and we recommend professional treatment. In bedbug treatment we require a greater amount of access due to the habits of the insect, which might include movement of headboards, skirting boards, fixed cupboard units, bed linen, etc. A four hour exclusion time is needed once the treatment is completed. The two most common types of cockroaches to infest commercial and domestic properties in the UK are the German cockroach and the Oriental cockroach. All cockroaches are public health pests because they contaminate food with their droppings causing stomach upsets and, in some people asthmas or allergic skin complaints. Cockroaches carry a huge host of diseases transferring them direct to foodstuffs or through their faeces. They multiple rapidly in favourable conditions and often go unnoticed until they are seen during the day which, because they are a nocturnal insect, suggests a serious infestation. 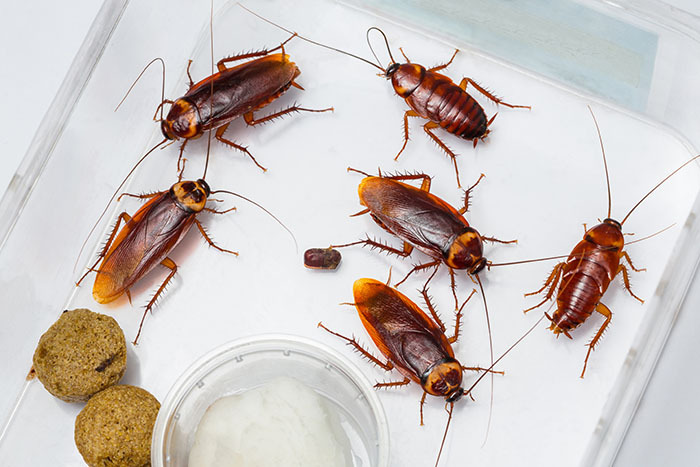 Cockroaches rely on water and warmth and this encourages their presence behind freezers, fridges and cookers, where they are often undisturbed with food debris and a nearby water supply. Sticky traps are used to find the worst affected areas and to monitor the progress of the treatment. Additionally treatments can be carried out with insecticides which contain an insect growth regulator to break the life-cycle of the insect. Cockroach gel is also applied to cracks and crevices ensuring no further outbreaks. A four hour exclusion time is required after this treatment is completed. 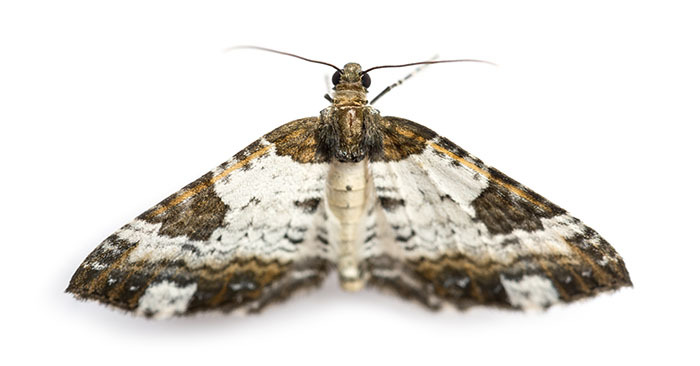 Common clothes moths attack natural fibres. Adults rarely fly to light as you would normally associate with moth. Any flying clothes moth is usually male. Females tend to just hop around on the floor in dark and uninterrupted locations looking for breeding sites. The period of egg, larvae, pupa and adult emerging takes about six weeks. These pest species are similar in that they both devastate natural fibres and can cause hundreds of pounds worth of damage. 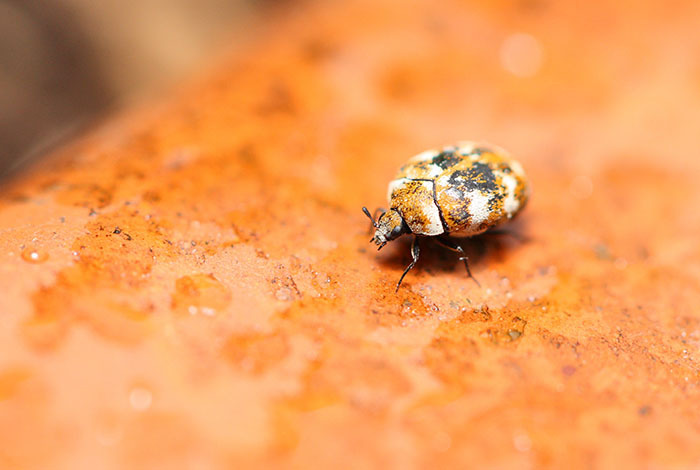 Adult carpet beetles predominately live outdoors feeding on nectar and pollen. They thrive in undisturbed places such as old bird nesting sites and animal remains. The larvae (woolly bears) can attack natural fibre carpets leaving vast bald patches in areas not usually visible without movement of side boards and cabinets etc. They also infest leather, fur and silk. Before we treat against any of these insect species it is imperative that access to all wall floor junctions and damaged fibres is available. We can then proceed to treat with residual and knock-down chemicals. A four hour exclusion time is required after treatment.